The Shambulance is an occasional series addressing bogus products and overhyped health claims. The chief tactical officer onboard is Steven Swoap. While you're enjoying a full Thanksgiving plate this Thursday, you might take a moment to be thankful that your meal isn't a single melon with a spoon stuck in it. Or a stack of plain lettuce. People who eat "mono meals" insist that having only one type of raw fruit or vegetable per mealtime makes their digestive process more natural and virtuous. In reality, it just takes the fun out of salad. Not to be confused with the noodle soup eaten by college students who are sick with mono, a mono meal is something eaten by healthy people who can afford to buy a lot of produce every week. It's an especially orthodox version of the "high carb raw vegan" diet—or maybe it's a sect of the "80/10/10" diet (which dictates that 80 percent of one's calories should come from carbs, and 10 percent each from fat and protein). However the eating style evolved, Buzzfeed recently claimed mono meals are a "new diet trend." While it's hard to tell how many mono mealers are out there—they're hardly mainstream—it's true you can search Instagram, Pinterest or Twitter and find photographs of people's thirteen-tangerine breakfasts with a side of hashtags (#801010 #monomeal #fruit!). Other sites are more explicit about the point of mono-ing your meals. It's all about simplifying digestion, they say. "If too much activity is happening in the digestive tract," according to Carla Golden Wellness, "enzymes can cancel each other out causing food to rot...With so many different kinds of foods going in at one sitting, our body can get VERY tired trying to sort out the different enzymes and digestion times for all these various foods." When I sent these claims to Steven Swoap, a physiologist at Williams College, he was pretty efficient about tearing them down. "You can't have too much activity in the digestive tract," he says flatly. Our bodies use different enzymes to digest proteins, carbohydrates and fats, and "there is no canceling each other out." These processes have evolved to happen at the same time with no stress to our organs—not the stomach or intestine, where digestion occurs, and not the pancreas, which cranks out the enzymes. "The pancreas multi-tasks as well as the best of them," Swoap says. Mono meal advocates say it's healthier to make things easy on your digestive system by eating just one thing. "When only one food is eaten at a time at a meal, the process of digestion is made to be extremely efficient," says the website Nature's Pilgrim. "The body must only focus on breaking down and absorbing one particular compound." "Not only is this garbage, it can actually be critically wrong," Swoap counters. Eating a heap of bananas for dinner doesn't make digestion happen faster—and we wouldn't want it to. "Nutritionists agree that taking a longer time is much better for you," he says. Absorbing carbohydrates quickly causes a spike in blood sugar, followed by a spike in insulin. The more sharply a meal raises your blood sugar, the higher its "glycemic index" (GI), a score given by nutritionists. A plain baked potato, for instance, has a high GI because we can very easily break down its starches into sugars and absorb them. But there's a way to slow things down and avoid the blood sugar spike: add some fat or protein. A dollop of sour cream or butter slashes the GI of that baked potato. So a mono mealer's goal of mainlining carbs is actually a bad idea. Eating a lot of high-GI foods has been linked to diabetes and heart disease. Luckily, though, a pile of fruit doesn't fit the bill. "If you each just one naturally occurring food (like a banana or a green pepper or a cucumber)," Swoap says, "this is inherently a meal that is mixed—mixed with carbs, protein, and fats." Every living cell contains fats in its outer membrane and proteins that drive its activities. Additionally, something like an apple or banana has plenty of fiber that slows down your body's absorption of its sugars. 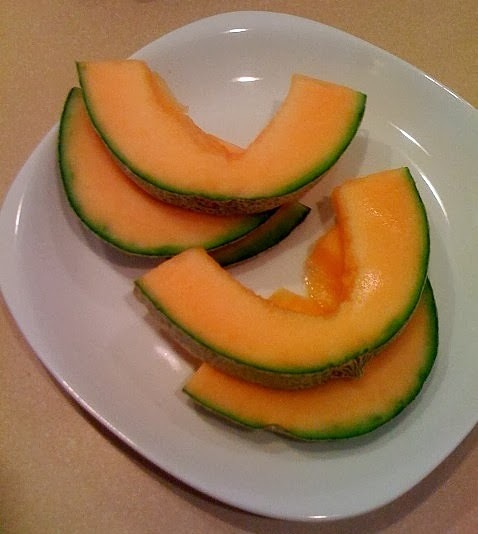 If you enjoy cantaloupe or plain vegetables enough to eat them exclusively for your meal, it probably won't hurt you. If you really enjoy them, you might become like 30 Bananas a Day user Jared Six. "I have NEVER enjoyed the taste of food more than I do now after 6 months of eating this way," he gushes. "People look at me like there is something seriously wrong for me for being so happy eating something like a meal of just lettuce." Just make sure those 30 bananas a day don't turn into 36 bananas in one sitting, because that's enough to cause dangerously high potassium levels in your blood—something for which you won't feel thankful. It is interesting how much bad science is involved in these "fad diets". What do these guys do? Sit around and make stuff up with the intent of marketing and profit? Eating 36 bananas and following good food combination are not related, but you melted in the two so you could have something to talk crap about.